In homeschool we've started 'Black History Month' studies. Grammy put up posters like this one with quotes from important african american people in our history. 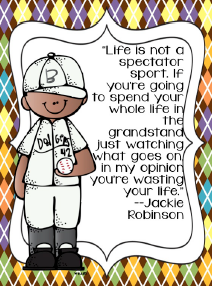 Grammy likes this quote from Jackie Robinson. We also watched a very good movie about Ruby Bridges. She had a lot of courage and made a difference for other children. I was shocked how mean the white adults and children were to others african american. It is so beyond what I can understand yet it goes on still today. Grammy says she has not remembered for a lot of years the hatred, violence and meanness of people until the last few years. Anyway we're sharing a video of Ruby Bridges below. I hope you will watch and reconsider if you have bad feelings toward others especially african americans.